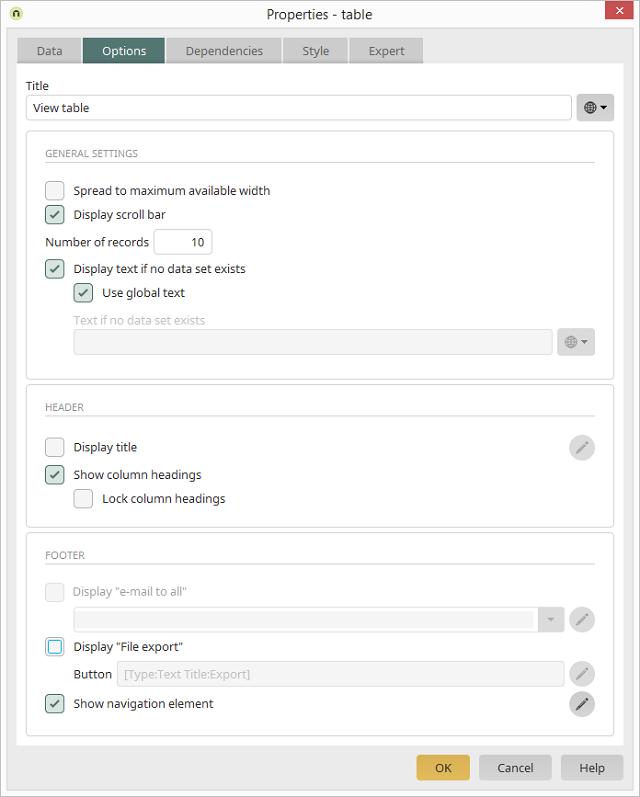 With this setting, the table will be take up the maximum available width of the page in the browser. If this setting is activated, a horizontal scroll bar will be shown if the view table is too wide. This allows you to define at what amount of records a navigation element will be shown beneath the table; the navigation element allows the user to access further pages of the table. If -1 is entered here, all records will be displayed. If this setting is active, a text will be displayed when there is no data available. Uses the text stored in the language constant "DR_NO_RECORD", it will also be displayed multilingually according to the Regional settings of the portal properties. A static text or a constant can be entered here if the "Use global text" setting is deactivated. The table heading will be shown. Opens the dialog where the heading can be modified. The column headings can also be shown or hidden. The column headings stay visible when scrolling. 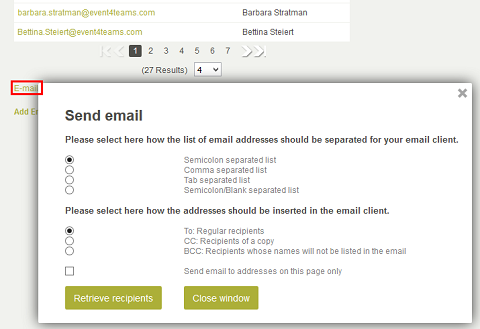 This option is only available if string data fields, with the control type email, are included in the table. Select the desired edit field in the drop-down list. In the browser, a link will be shown in the footer of the table, with which an email can be sent to all email addresses in the table column. Clicking this link will open a popup window where the user may define separators and how the the email addresses should be used, as well as start their default email client. The distribution list that the email will be sent to will be created from the email addresses in the table. Opens a dialog where the properties of the "Email to all" button can be edited. This setting will show a button below the view table that allows the user to export all data records. Clicking this button will open a popup window where the user selects the separators and can choose the format of the export file (text, Excel). 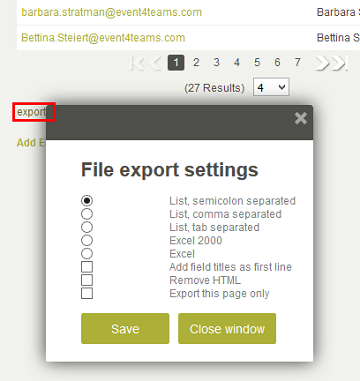 Opens a dialog where the properties of the "Export" button can be edited. The navigation element will be shown in the footer of a table as soon as the number of existing data records exceeds the number of records to be displayed within a table. Opens a dialog where the settings for the navigation element can be changed.